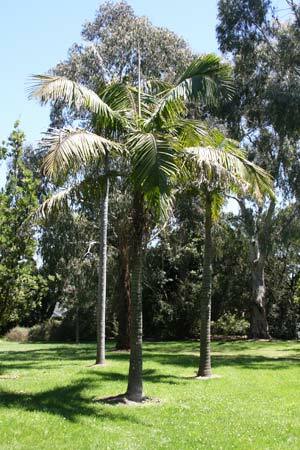 Bangalow Palm (Archontophoenix cunninghamiana) is a native palm tree that will add height to the garden. From the rainforests of the east coast of Australia from Queensland to New South Wales, this is a versatile landscaping tree. This is palm tree with a number of good points, its root system is fairly shallow, and not regarded as invasive. It grows with a slender single trunk and is fast growing. So excellent for commercial and residential areas where you wish to create a tropical look. It does have a few specific care requirements, well drained soil and moisture. Poor drainage can lead to root rot. It is also not a palm tree for very hot locations, you will need extra water in these areas. 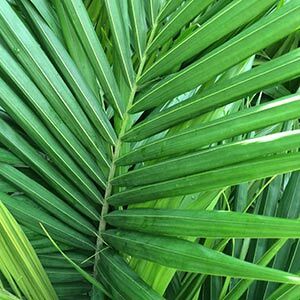 Although Archontophoenix cunninghamiana or ‘Bangalow Palm’ as it is commonly called is a native of Queensland., it is a cold hardy palm that will grow well as far south as Melbourne. This is a self cleaning palm with an attractive smooth trunk. Its natural habitat is as a rainforest tree, and it grows best in a sheltered position in humus rich soil, similar to it natural conditions. Growth rate is fast at first at up to 1m per annum in good conditions, rate them slows as the tree ages. Slower growing in cool climates. Excellent a solitary feature plant and equally suites to planting in avenues along a driveway. Suited to background planting near swimming pools to give a tropical effect. Very similar in growth to Archontophoenix Alexandrae but heavier in growth, best suited to more sheltered positions. Fertilize – Apply low doses of a complete fertiliser each month for good growth in early stages. Root system – Although fibrous is not regarded as invasive.